Chitra: Make. It. Warm. Now. This morning, the house was cold. The boiler was just about to trigger on. I put the kettle on to make tea and realized our girl cat, Chitra was crouching on the kitchen rug glaring at me reproachfully. She darted away toward the living room when I approached to pet her. I followed. There was a faint glow at the hearth, really just a few glowing coals from the fire Will started when he got up this morning. With our earlier supply of maple tucked in the barn, I could revive a pile of coals like that with a stick or two and a good log. Or maybe just the log. But we’re down to that stash of punky yellow poplar that we avoided burning last year. It had been stacked in the woods too long. (Seasoning — right…) The logs look good but they don’t make for a satisfying burn. I must have picked up one of those yellow poplar logs this morning, because for about 20 minutes all I succeeded in making was a copious amount of billowing smoke. I poked and rearranged and was generously rewarded with a face full of smoke. Then flames finally leapt up. Ah, here we go. After another 20 minutes I realized the cat was still glaring at me. Fire. Not. Hot. Crap. Tending the fire this morning has been a struggle. At this point in the winter, it should not be too difficult for me to keep a fire going. Not that we burn wood every day, but I have assisted with keeping quite a few fires going this season. I’ll admit, there is a knack to it, but it’s not exactly rocket science. However, to get a good burn, you do need quality fuel. We’re down to the second-quality section of what is stored in the barn. A couple of weeks ago, I went out to the Mother Lode woodpile behind the spruces to probe for some more of that maple. I brushed off the crusted snow and removed a few loose ice-covered logs from the top layer. I grabbed ahold of a tempting log. Stuck tight. The entire huge pile seems hopelessly fused together with ice. After we got the barn filled with as much wood as we had room for, the thought occurred to me to tarp the woodpiles outside. Yes, it did. Did I act on that thought? Of course not, the barn was chock full of dry wood! We couldn’t possibly burn all of that! Brilliant. So, where’s Chitra right now? She’s curled up in the bright winter sun on the dining room rug. Where it’s warm. Maybe I’ll put just one more log on before lunch, trip the thermostat and abandon the living room for the sunny side of the house. 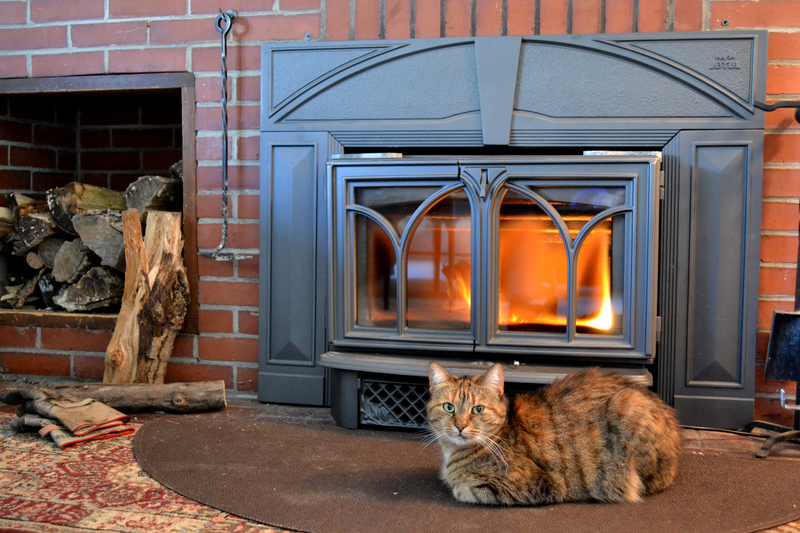 Categories: Cat-related, Updates | Tags: cats, fire, fireplace insert, firewood, winter, wood stove | Permalink.